With the passing of time it’s possible to look back on any period with nostalgia. Stephan Elliott proves the point in Swinging Safari, a time capsule of the 1970s that’s advertised as a comedy, but may be the greatest Australian horror film since Wake in Fright. It’s more common for moviemakers to feel nostalgia for the 1950s, a time of post-war recovery, although I recently heard British director, Stephen Poliakoff, speaking persuasively about the “brutality” of that decade. 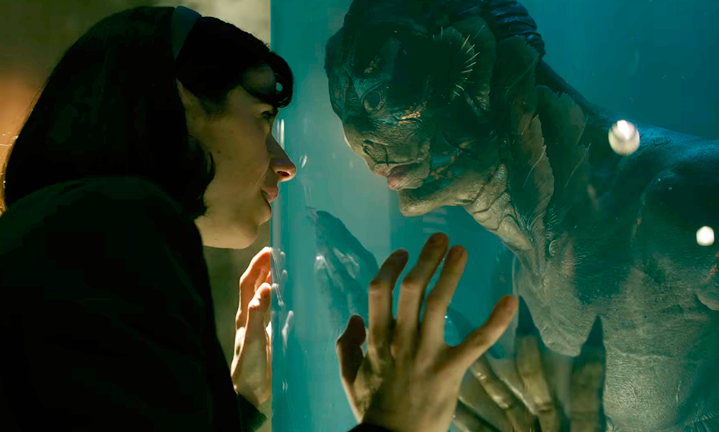 In The Shape of Water, Guillermo del Toro shows it’s possible to be nostalgic for the feel and look of an era but fully cognisant of its nastiness. Del Toro sets his film in Baltimore during the early 1960s, at the height of the Cold War. It’s a stratified society in which there are clear winners and losers. Men rule over women, whites dominate blacks. Those with good jobs and aspirations surround themselves with consumer comforts, the rest merely scrape along. Only the cinema allows everyone to share the same dreams. Sally Hawkins plays Elisa Esposito, who lives by herself above a shabby movie theatre and makes a living as a cleaner at a government scientific facility. It’s Hawkins’s second successive role playing a damaged but indominable spirit. In Maudie she smiled her way through unspeakable hardships, in The Shape of Water she is mute – but cheerful, positive and strong-willed. Her best friend is her neighbour, Giles (Richard Jenkins) a sad old homosexual who squanders his artistic talents drawing advertisements for magazines. At work Elisa is looked after by Zelda (Octavia Spencer), an outspoken black woman who knows her place but has never come to like it. Being mute, gay or black are forms of social disqualification. The lords of this world are figures such as Richard Strickland, a high-ranking functionary who turns up at the centre with a mysterious creature in a tank, that is referred to as “the asset”. In the role of Strickland, Michael Shannon produces a chilling portrait of a dead-eyed, cold-hearted sociopath focused solely on his own status. Strickland lives in a suburban bungalow straight out of an episode of Madmen, with his trophy wife and two kids. He buys himself the kind of flashy car that befits “a man of the future”. The “asset” turns out to be an amphibious humanoid (Doug Jones) captured in the far reaches of the Amazon. A more attractive cousin to the Creature from the Black Lagoon, who first appeared on movie screens in 1954, the aquaman inspires an especial loathing in Strickland who takes every opportunity to torture his captive. The scientists are hopeful that by studying the “asset” they may learn something to give them the edge in the space race with the Soviets. The Russians are just as curious, and have already installed a spy in Dr. Robert Hoffstetler (Michael Stuhlbarg). When Strickland proposes that the creature be vivisected, Hoffstetler is horrified. Even more horrified is Elisa, who has gradually built up a relationship with the prisoner, feeding him boiled eggs and playing Benny Goodman records when she is left alone to clean the laboratory. Where Strickland sees only an animal, both the cleaner and the Russian spy recognise the creature’s intelligence. The mute Elisa finds a powerful affinity in the voiceless amphibian, and plots a rescue. I won’t say any more about the plot, which has vertiginous elements of fairy tale and romance. Unlike most Hollywood monster films – the notable exception being James Whale’s original Frankenstein (1931) – this story shows us a uniquely sympathetic creature. For Elisa it’s virtually love at first sight. Del Toro has a wonderfully complete view of the filmmaking process. The feature is bathed in shades of green, from Elisa’s watery dream of the opening sequence to the tiled laboratory. There are sickly green cakes, a green jelly, and Strickland’s “teal” coloured car. This is complemented by a brilliant score from Alexandre Desplat, which conjures up memories of lush, old-style movie music. There’s one fantasy sequence that felt uncomfortably close to a scene in Lee Chang-dong’s Oasis (2002), but perhaps Del Toro was merely paying homage to a little-known Korean masterpiece. This is probably the most obscure reference in a film that draws on an entire album of other movies, notably The Creature From the Black Lagoon and Jean Cocteau’s Beauty and the Beast (1946), with side-glances at everyone from Fred Astaire to Shirley Temple. Even the name “Elisa” conjures up thoughts of the rough diamond from Pygmalion. Del Toro has shaped this anthology into an utterly seductive story in which flashes of violence and bigotry keep sentimentality at bay. It’s a film that’s both surprising and touching, with Sally Hawkins producing an Oscar-worthy performance while hardly saying a word. The setting may be 1962 but there is a lesson for all time in the way the downtrodden make common cause with the ‘monster’ to expose the inhumanity of those who believe they hold the future in their hands.